Songmakers Australia is currently seeking applications for its Artist Development Program. The program will foster up to four (4) outstanding Australian singers and pianists in 2019. Young artist program for singers and pianists, specifically aimed toward developing recital careers. The program has a strong mentoring focus. Should already be committed to a professional career encompassing recital and the broader development of Art Song in Australia. Must be Australian citizens or permanent residents. Will be aged between 21-32 years of age as at 1 January 2019. Full CV including study and any relevant professional experience. Proof of age and Australian residency. 2 Sample Recital Programs – 45-60 minutes duration, no interval. repertoire (i.e. Schubert, Schumann, Brahms, Fauré, Debussy). The audition panel will comprise the Artistic Director of Songmakers Australia who will play for all applicants, plus other industry professionals and/or core members of the ensemble. Possess well-developed skills in language, musicianship and performance. Be paired with one or more mentors who are core members of Songmakers Australia. Have access to Songmakers Australia rehearsals during the 2018 calendar year for auditing purposes. Receive no less than 36 hours of coaching with the Artistic Director at the Songmakers studio in Hawthorn, Victoria at mutually convenient times. Give one recital engagement together with the Artistic Director at a mutually convenient time. Receive an agreed percentage of Box Office takings from the recital, which will be presented under the auspices of Songmakers Australia. Final recital programming is at the discretion of the Artistic Director. Any changes to proposed programs will be negotiated as far in advance as possible. The successful applicant/s will be styled as a “Young Songmaker” for the duration of the 2018 calendar year. The successful applicant/s will be expected to engage a reasonable level of media and promotional activity for the duration of their tenure. Unsuccessful applicants may request feedback from the panel via email only. There are no further fees payable to any applicants for travel or other expenses beyond negotiated performance fees. Songmakers Australia reserves the right to suspend the program at any time. This will be communicated in writing and no further correspondence will be entered in to. Applications should address all items on the applications checklist above, and be forwarded to songmakersaustralia@gmail.com marked to the attention of the Artistic Director no later than December 9 at 5pm. Our Education Programs continue to be recognised as leading in the field for young singers and pianists. Following on the footsteps of The Lieder Society of Victoria and Melbourne International Festival of Lieder and Art Song, Art Song Canberra has created The Eleanor Houston Art Song Canberra Bursary to honour its founder, Eleanor Houston OAM. Ms Houston was a generous, dedicated and gifted Australian operatic and recital soprano. This annual travel scholarship will help ATC young performers applying for any of Songmakers Australia seminars and masterclasses. Further details and application forms will be announced later in the year. Songmakers Australia is currently seeking applications for its Artist Development Program. The program will foster one outstanding Australian singer and pianist in 2018. Will be aged between 20-32 years of age as at 1 January 2018. Receive no less than 12 hours of coaching with the Artistic Director at the Songmakers studio in Hawthorn, Victoria at mutually convenient times. Applications should address all items on the applications checklist above, and be forwarded to songmakersaustralia@gmail.com marked to the attention of the Artistic Director no later than November 19 at 5pm. In March 2017 we announced the appointment of our inaugural Young Songmaker, Lyndon Green - Tenor. Lyndon received mentoring and coaching from the Songmakers throughout 2017, and gave a Lieder and Art Song recital together with Artistic Director Andrea Katz in September. Lyndon Green completed his Bachelor of Music Performance (Honours) at the Melbourne Conservatorium of Music. A winner of multiple scholarships, Lyndon’s experience on the concert platform as soloist includes Mozart Requiem in D minor KV626, Mozart Vesperae Solennes de Confessore KV339, Rachmaninoff Vespers, Dvořák Mass in D minor, Kodály Missa Brevis, Vivaldi Magnificat in G minor, both Vaughan Williams Ten Blake Songs and Five Mystical Songs, Britten’s Rejoice in the Lamb, St. John Passion BWV 245, Magnificat BWV 243, as well as several J.S. Bach cantatas. Recent highlights for Lyndon include the performance of Schumann’s Dichterliebe with pianist Stephen McIntyre, a CD recording featuring Lyndon as a major artist and being awarded the 2016 Maroondah Singers Memorial Scholarship. In addition to his selection as the inaugural Young Songmaker for 2017, he also joins the State Opera of South Australia Chorus in Handel's Saul as part of the Adelaide Festival in March. We are very excited to announce our annual Interpretation of Lieder and Art Song Masterclass! This year's dates are April 12 to 15 (10 days before Liederfest). Singers and pianists preparing for this competition will have the opportunity to air their repertoire and work on all aspects of their performance: ensemble work, vocal and piano technique, diction and general presentation. Participants can attend for 1, 2 or 3 days. Auditors are also welcome. For more information and application form follow this link . This short course is designed to help young singers and pianists in their preparation for competitions and performances and centres around masterclasses given by members of Songmakers Australia. 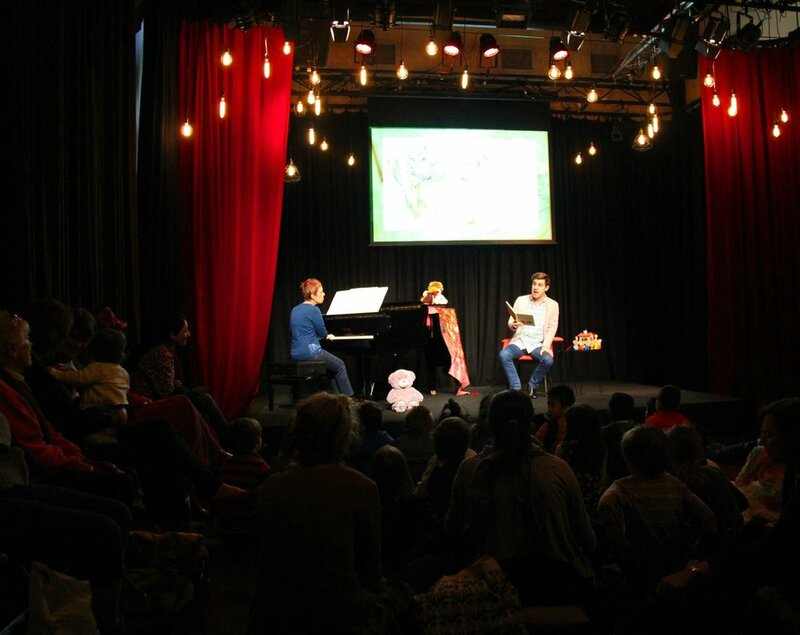 Below are some pictures from two weekend Master Classes at the Melbourne Conservatorium of Music in March 2014. A cabaret for Australian children taking its title and core material from the delightful publication for the young by A.B. “Banjo” Paterson. Previously presented at the Melbourne Recital Centre Salon and the Montrose Civic Centre in September 2014. Merlyn Quaife was appointed Co-ordinator of Classical Voice at the Sir Zelman Cowen School of Music in 2014. Under the experienced and nurturing guidance of "Melbourne’s much loved soprano" (The Age, 2012) the study of voice at Monash University takes a new approach, providing a supportive, encouraging environment for singers to refine their craft, expand their knowledge and realise their potential. The course is devised as a series of Modules, giving students a breadth of knowledge of vocal repertoire. Andrea Katz teaches Italian and Spanish Song and Nicholas Dinopoulos is Music Director of the Monash University Singers as well as teaching Oratorio, Spanish Song. For more information follow this link.